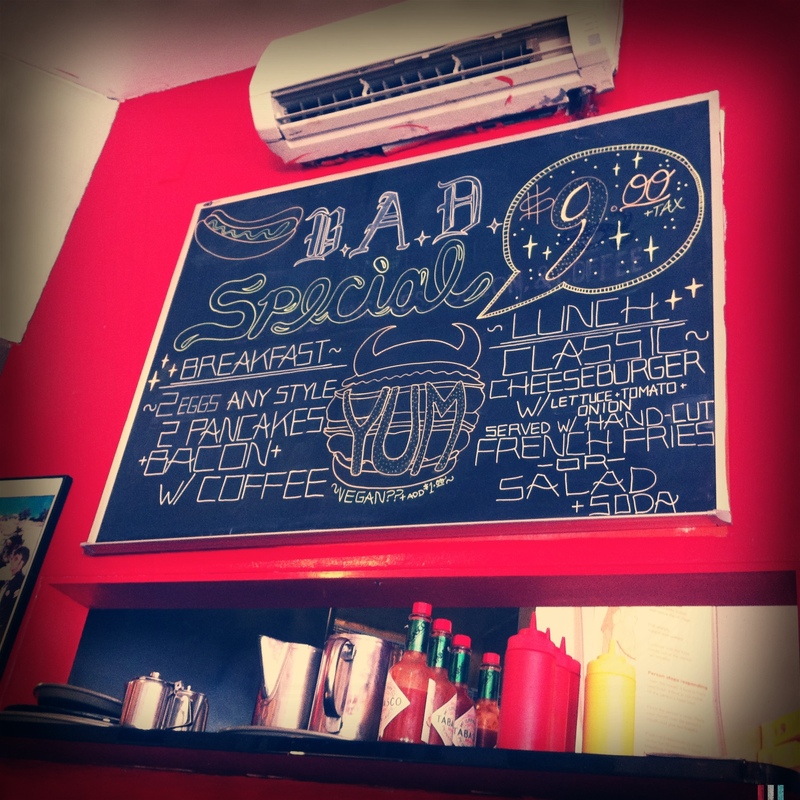 B.A.D Burger | Oh No! Not Another NYC Food Blog! Burgers, breakfast & more in Williamsburg. 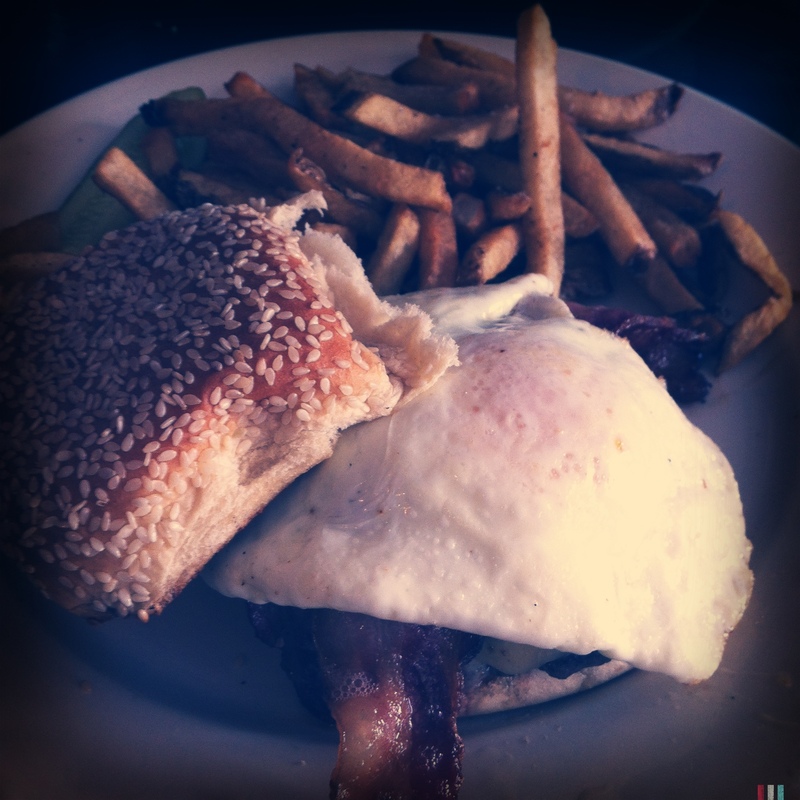 I had the Wake & Bake Burger – 2 beef patties topped with bacon & eggs. The burger meat was well-seasoned and juicy, and the whole big sloppy hot mess was fantastic for the first half (even though I lost the bacon early on). Then I came up for a breather/attempt to reposition everything back on the bun and the sheer amount of grease I had just consumed caught up with me and I couldn’t finish. It was great, but I couldn’t rally without running the risk of exploding. 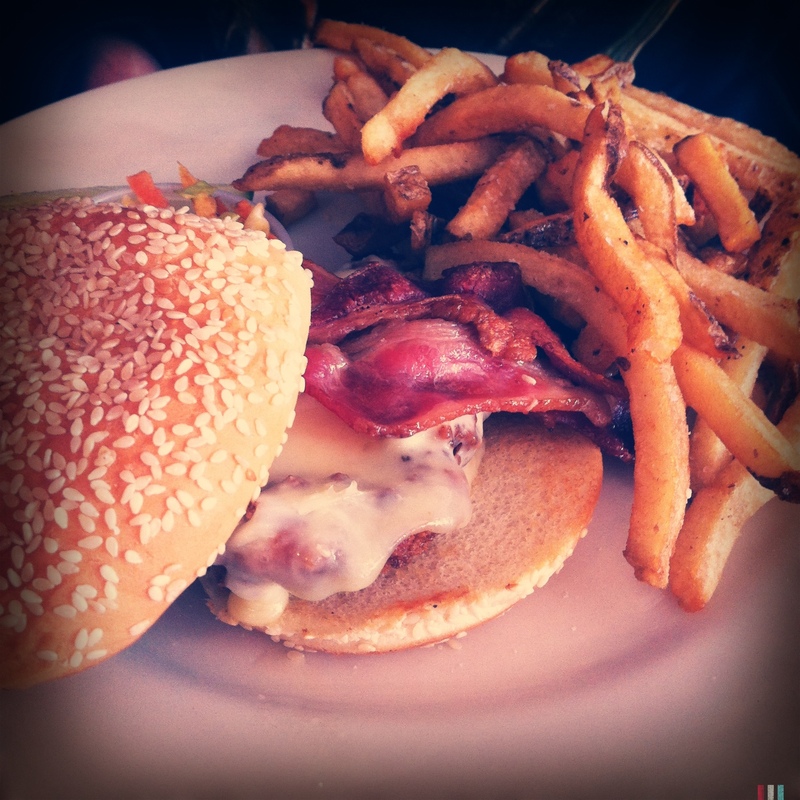 My DH had the Dirty South Sandwich – fried chicken breast with pepper jack cheese & bacon. This was also a well-seasoned and juicy sandwich with great attention to flavor combinations. Not quite the hot mess the burger was. Each sandwich came with fries and a little side of slaw. The fries tasted exactly like the fries you get at the fair. I don’t know how these wizards managed to capture that magical flavor, but they are now my junk food gods and I must stay far, far away until I am firmly entrenched in the exercise regimen I’ve been supposed to start since November. The slaw was also surprisingly good. If I hadn’t just consumed enough meaty potatoey grease to choke a kitten I would have enjoyed it more. Having silverware would also have helped. 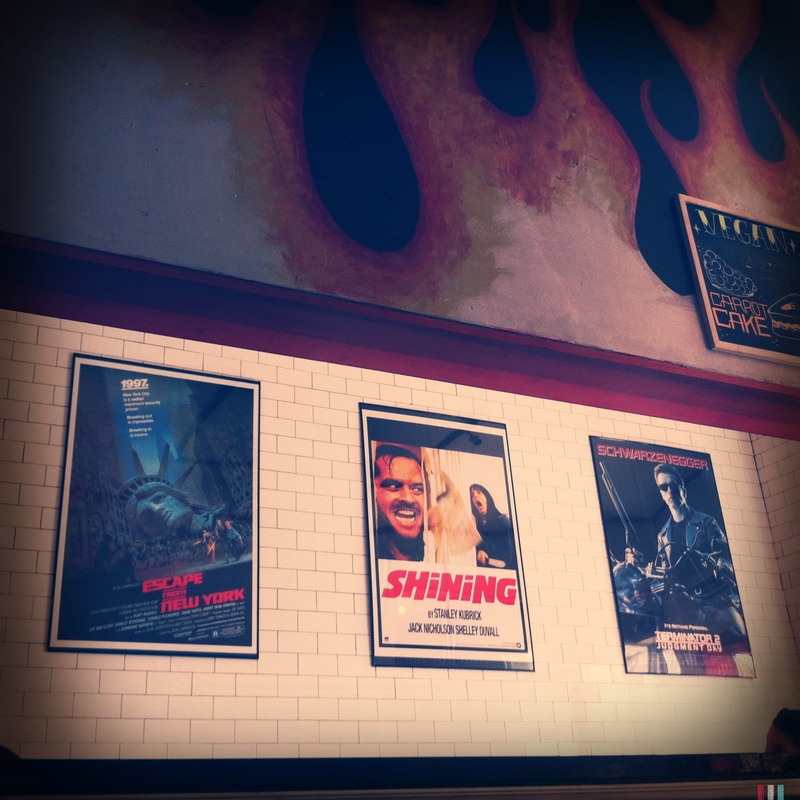 Cute rock n roll diner theme with flames, movie posters and rockabilly waitresses. The service wasn’t awesome and the food was s-l-o-w. So slow they must have a lone one-armed, one panned chef. With a dull knife. That, or they had to hunt the wily cow. Or find a fair from which to source the fries. Take your pick. B.A.D or Breakfast All Day has a little for everyone, with a whole host of vegan, vegetarian and gluten free options. And we’re not just talking a Gardenburger, either. These guys are serious about catering to special needs diets. It’s just too bad the food took so long (we’re talking over 45 minutes in a restaurant with 4 tables seated – 2 of which had their food already). 3.5 out of 5 because it took so long for the food to come out we both felt like we were grounded. If you happen to be walking past and happen to have an afternoon to kill, stop in. The fries alone are worth a trip. Consider calling ahead and picking them up at the to go counter.